This is a four-host XenServer cluster that I have barely touched other than to do what I was trying to do here: spin up a vm. Back in the heady days of yore when we were a bursting at the seams team of five, this cluster belonged to Someone Else. Someone Else is gone, and it's now one of those un-loved, you-touched-it-you-own-it systems. You know what I'm talking about. So, great. I hit the Googles because, while I know enough to get the gist of the error message (some block device for my vm is attaching to dom 0 which is the native domain, Ground Zero for Xen), I had no idea what to do about it. This is apparently a common error message as I found a bunch of posts about it. Unfortunately in most cases the OP would come back and say, "Hey, I rebooted it! All good now!". This made me smack my head and groan because ideally there'd be a solution that did not require a reboot, this being a prod server and all. I wasn't alone in this, but no one had a clear answer. The few posts that did attempt to fix the error didn't go into enough detail for someone not intimately familiar with the inner-workings of Xen's virtualization stack. For example, there were a lot of suggestions to simply run xenstore-ls and use that output to delete the offending device. Have you ever run xenstore-ls? There's a lot of info, and finding anything online that tells you what exactly you're looking at is pretty much impossible. You know what I didn't want to do? Start trying to solve yet another problem in the midst of the one I was currently struggling with. That meant a reboot was definitely going to take some prod vms down. As a last ditch effort I hit the Citrix forums. 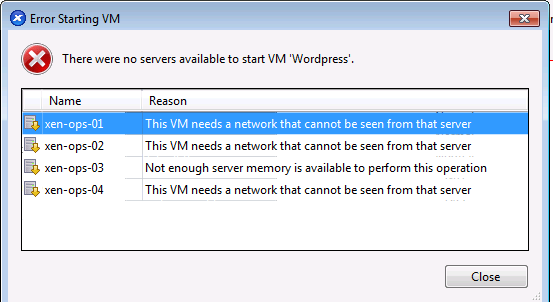 I ran those commands and tried to start the vm up again. Guess who came back to join the party? Looks like I'm diving down that rabbit hole after all. I checked the Networking tab for the VM as per this guide and found that in comparison to other vms, this one had three Networks attached instead of two. I deleted the third and tried again. This time I received a bootloader error: The bootloader for this VM returned an error -- did the VM installation succeed? Error from bootloader: no bootable disk". This makes sense if I think about it, because I did run a command with the word "destroy" in it a few minutes ago. I deleted the vm and started over. This time I only got the network error message, not the Dom0 message, so that's a positive sign. I deleted Network 3 again (I will probably have to find out what this is and why it's being added to new VMs), and I finally got the VM to start up. Yay. Now I can actually, you know...do what I was supposed to be doing all this time. Progress!